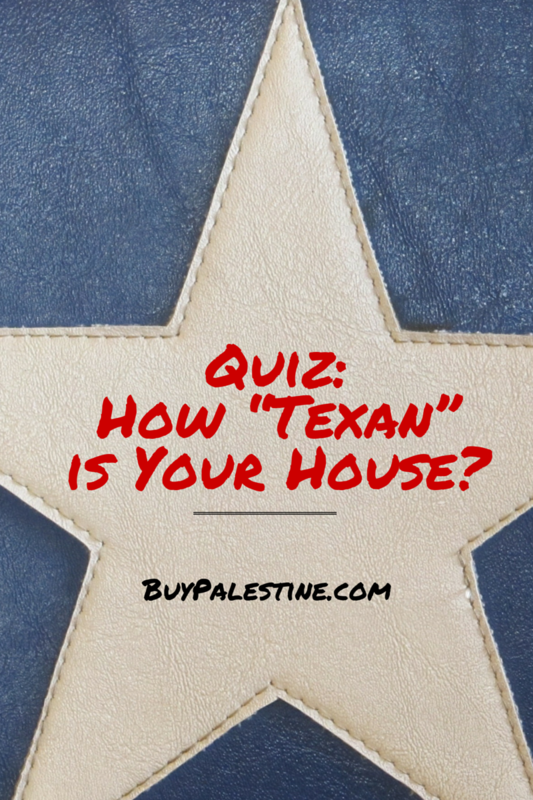 Palestine Real Estate & Palestine TX Homes For Sale | BuyPalestine.com Quiz: How “Texan” is Your House? Quiz: How “Texan” is Your House? Evidently being a lifelong Texan has desensitized me to home trends that are common for Texas. I honestly had never thought about it before, but we are surrounded by “Texas style.” I know we are a proud state, but really, can you blame us? However, from the eyes of outsiders we are obsessed with anything and everything Texas. So what about your house? —I bet you have a little more Texas in your house than you might think! HOW TO PLAY: Print out and Grab a pen and read through the list below, checking off any that apply to your house. Give yourself 1 point for each box checked. After you have checked the boxes, tally up your score and find out your “Texan House” Score. You have Texas-shaped yard art—from Texas stepping-stones to birdbaths and beyond, we love Texas shaped stuff! You have metal stars in your house (or anywhere on your property). Metal stars are a perennial favorite of Texans everywhere—the more rusty, the better. You have a horseshoe over your door—this may not have originated in Texas, but it’s good luck in Texas anyway! You have a “Mud Room”—because where else would you leave your muddy boots? You have a BBQ grill and/or BBQ patio—and you use it nearly year-round. Bonus point if you also have a smoker! You own a boot jack—it’s kind of like a shoe horn, but fancier. Your décor consists of Aggie logos or Bevo collectibles. You have Dallas Cowboys treasures on display. You picked a paint color scheme based on your team’s colors—but is it orange or maroon, that is the question! You have a gun safe or built-in gun display cabinet—and of course, it’s not big enough. You have barbed wire or horse wire fencing (yes, even if it is temporary). You have a swimming pool—they come in all materials, shapes and sizes. sooo…How Texan is Your House? 0-4 points: Your house is a MILD TEXAN. Your house is Texan, but isn’t too loud about it. Country décor and team tchotchkes don’t have a place in your home. You may need to hang up a Texas flag or twelve. 4-8 points: Your house is a HOT TEXAN. Your BBQ grill is always ready to host your neighbors and your metal stars are always perfectly rusted. Your house style is laid-back Texas without being too cliché. You may want to hang a Texas flag, just to be safe. 9-16 points: Your house is a SUPER SPICY TEXAN. You’ve got the tea on ice, the Bluebell in the deep freezer and the steaks on the grill. Your house is about as Texas as it gets! You are a proud Texan and want anyone and everyone to know it. You don’t need an extra flag, but you should hang another one anyway! We all have a little Texas (or a lot) in our homes. It’s what makes us, well, Texans. Some of these are definitely stereotypes, but I guess it’s true that often clichés are cliché for a reason and this is all for fun anyway. Whether you were born in Texas or you got here as fast as you could, I’m certainly glad you’re here. It’s funny; it took someone pointing out these things as being unusual, because to me they are not unusual at all. I probably don’t have as many Texas items as I should, but Texas love is ingrained in my brain and it sure is a great place to call home—even if the only Texas flag you waive is in your heart. Lisa E. Priest loves “Texas-sized” anything and is a Palestine, Texas REALTOR® with Picket Fence Realty, Inc. You can reach her via phone or text at 903-948-3343 or read more at BuyPalestine.com.